Dr John W. Ashe, President of the United Nations General Assembly who arrived in the country to attend the inauguration of the 15th World Youth Conference met President Mahinda Rajapaksa at Temple Trees this morning (07). During the discussion he acknowledged the progress Sri Lanka has made in the recent past. 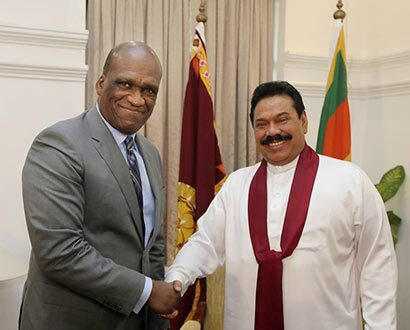 “We have seen the development that has taken place”, Dr.Ashe told President Rajapaksa. He also expressed his appreciation of the speech made by the President at the inauguration of the World Youth Conference in Hambantota yesterday (06). President briefed Dr.Ashe about the progress that Sri Lanka has made after suffering from nearly 30 years of terrorism. “At present Sri Lanka’s annual average growth rate is 7%. In the North it is around 22%. Sri Lanka is among the few countries in Asia with a high growth rate after China”, President Rajapaksa pointed out. irrigation and in areas of health and education. “At present the highest number of students who qualify for higher education come from the Jaffna district. Country’s computer literacy which was only 3% of the population in 2005 has now reached 50%. Living standards of the people have gone up. Sri Lanka is a welfare society”, President Rajapaksa further said. President Rajapaksa told the UNGA President that undue external pressure on the country has become a hindrance to the progress. When a member of the UN delegation inquired about women’s participation in Sri Lanka’s social life President Rajapaksa pointed out that their participation is around 60 % or more in many areas specially in education, health and the banking sector. “It is only in politics such a progress is yet to be seen”, President observed. UNGA President’s delegation included Chef de Cabinet Ambassador Paulette Bethel and several others. Deputy Speaker Mr. Chandima Weerakkody, Secretary to the President Mr. Lalith Weeratunga, Secretary Ministry of External Affairs, Mrs. Kshenuka Senevirathne and Sri Lanka’s Permanent Envoy to the UN Dr. Palitha Kohona were also present at the discussion.